Whether you’re heading ashore to try your hand at surfing or are taking out the tender for a spot of water skiing, investing in a good wetsuit is essential to protect against cold water and inevitable falls when practising water sports. Even if you do not enjoy them yourself, a good host or charter yacht owner should always keep a range of sizes and weights on board so guests don’t miss out. 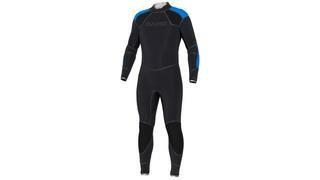 Read on to see our pick of the best wetsuits for every scenario. Even in the warmer climes of the Caribbean and Mediterranean a wetsuit is still essential to protect against cooler currents and jellyfish stings. Opt for a shortie suit with half or T-shirt length sleeves for comfort and a weight of around 2mm for flexibility. O’Neill’s Hyperfreak wetsuit is ideal for summer sports thanks to its quick dry Technobutter neoprene - which promises to be 20% lighter and absorb 30% less water than traditional materials - front upper zip entry for increased ease of movement and minimal seam design. If even the coldest temperatures can’t stop you diving off the side of your explorer yacht then you’ll need to invest in a good quality winter wetsuit. Long sleeves and full-length legs are a must and booties, hoods and gloves are also advisable. NP’s top of the range Nexus wetsuit has inner layer insulation built into the neoprene to trap heat and increase buoyancy and flexibility while anti-odour, antibacterial, quick dry and warming properties come as standard. Even in the warmest climates, scuba diving will mean braving some pretty chilly waters. 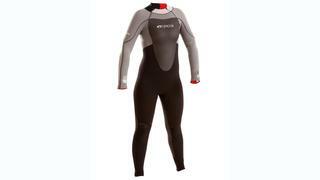 Opt for a thick (around 7mm) high-stretch neoprene, good quality stainless steel zippers and lightweight internal linings which will all make the suit warmer and easier to move around in. We love the ‘made to be forgotten about’ ethos behind Bare’s 7mm Elastek full suit. If you’re looking to stock your superyacht with wetsuits that provide good all-round protection for a variety of water sports (useful for charter yachts) then the Typhoon TX2 is a wise choice. 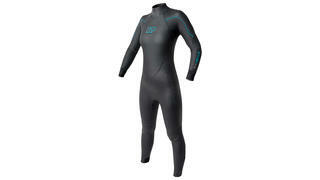 With versions available for both men and women, this full suit is constructed from T-Flex extreme flex neoprene, lined with a warm thermal polypropylene and finished with a front zip system that increases flexibility across the back – all at a price that won’t break the bank when they need replacing. 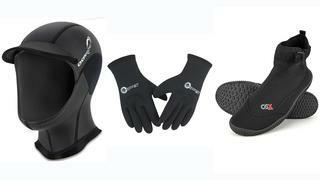 As mentioned previously, buying a hood, gloves and booties to wear with your wetsuit is a great idea for all users. Whether it's extra warmth for deep waters and winter use or to protect both skin and coral against damage from collisions, they are a precaution well worth taking. Choose super-stretch neoprene for hoods and gloves to make them easier to get on and off – a 5mm thickness is ideal for winter while a lighter 3mm neoprene can be used during the summer months. Gloves, hoods and boot ankles should be as tight as possible to avoid water getting in and it is handy for boots and gloves to have grips – Osprey does a great range in all three.